Reviewing books from Counter-Currents is always quite a task as more often than not they are not extended essays or manuscripts per se, but rather collections of blog posts, articles and other various texts, sometimes touching a wide variety of topics hard to combine and analyze in one single article. 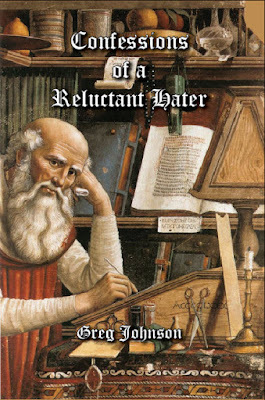 Greg Johnson's Confessions of a Reluctant Hater, recently revised and expanded from the original 2010 edition, fits that pattern: a series of articles touching a great range of topics from Spengler to Eastern spirituality passing by Jim Goad and Stuff White People Like. Definitely hard to review, but easy to read. People who think political books are deadly boring must read this page turner. Post-literate readers who cannot fathom the idea of a huge academic book will love the light and often humorous tone displayed in the 52 essays of the second version. People who have been following the Alternative Right for a few years now will not necessarily learn anything new in this book, but might start their own reflections on various topics such as homosexuality and drugs, two issues on which Johnson takes a definitely unorthodox stand which, while not necessarily convincing the reader, will definitely lead him to re-evaluate his own stance. All in all, the targeted reader for this book is the recovering liberal or the multi-cult advocate who is starting to sense there might be something wrong; that reality and utopia do not fit as they should. Johnson's West Coast style of White Nationalism, called at that time American New Right but later relabeled Alternative Right, will definitely appeal to them. I find the focus of the book is not necessarily politics, but rather Johnson's hatred of hypocrisy and doublethink (as highlighted in A Conversation about Race), which then leads to White Nationalism. The examples of hypocrisy in our modern society are countless and seem to be now part of the whole political correctness concept and I would even go as far as claim that it is part of the foundation of our multicultural societies. Wishing "Merry Christmas" to a Muslim will not really offend him, but he will hypocritically claim to be insulted in order to further his own agenda. The same can be said about racial profiling and many other issues often debated in the mainstream media. Even if the author does not state it, we could say that hypocrisy is a major facet of our society, at least equal to political correctness. And both work hand in hand. The title of the book points to a very telling example. When we read the newspaper or watch the news, which fortunately less and less people are actually doing, one has the impression that White Nationalists, Identitarians and other like-minded people try to stir up hatred towards other races. Coming from multicultural advocates this accusation is pure nonsense: hatred is caused by frictions and tensions; and logically frictions and tensions are caused by proximity, exactly what the nationalists want to avoid and exactly what the multiculturalists try to impose on everyone against their will. So, therefore, who is really causing and creating hatred here? The same line of reasoning can be applied to other issues as well. Who must be blamed for the high rate of Black arrests? White cops who fight crime or Blacks who commit far more crimes than other ethnic groups? Why do we justify the higher success of Whites versus Blacks in IQ tests on culture, while admitting superior academic abilities for Asians who outperform Whites? The liberals' hypocrisy is even more blatant when it comes to freedom of speech and academic freedom. Liberalism stands for a diversity of opinions — or so it claims — but never has repression been harsher than today for any dissenter like Kevin MacDonald (TOO) and American Renaissance (AmRen). The so-called Enlightenment has brought about a new Dark Age where facts that do not fit the zeitgeist are simply silenced and people who wish to discuss them are censored. And anyway, this is not the liberals' most blatant doublethink! Their neocolonialism is. By claiming to profess a universal thinking, they wish to force it upon peoples who never will adopt it and do not even want to. This way of thinking that everyone wishes to emulate them or wishes to adopt the "superior" liberal values they profess, and the way the Left imposes itself to enlighten the rest of the universe, shows that the real supremacists do not always wear a white hood. The last, but not least, hypocrisy Johnson is fighting, and it is the current objective of the metapolitical struggle we are engaged in, is the White implicit consciousness. Like Kevin MacDonald and Jared Taylor (AmRen), Johnson sees that there is a strong "implicit" White consciousness; that Whites will associate according to their race without consciously thinking of it that way, but because it is "implicit," it will lead nowhere. We must therefore be honest and frank about our ethnocentrism, a phenomenon Liberals are not immune to, and admit that it is not only natural, but moral and legitimate. As a people we must rediscover our will to live and strive together, and like Johnson reminds us, "if there is a will there is a way."